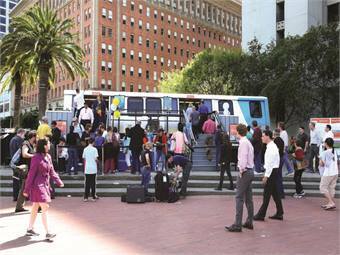 The strong economy in the San Francisco Bay Area, due in part to the abundance of high-tech jobs and the cultural shift toward a more transit-oriented lifestyle, are proving to be a boon for the Bay Area Rapid Transit District (BART), so much so that ridership on the system has been on a steady uptick for several years. Despite this good fortune, BART is having difficulty meeting demand. Weekday ridership is projected to increase to 500,000 in the next five years and one million in the next 40 years, according to BART data. “Our ridership has grown a lot over the last decade, we need more capacity,” says Aaron Weinstein, BART’s chief marketing officer. Additionally, the system is running the oldest railcar fleet in the U.S., with an average age of more than 30 years. Although the oldest cars have since been rehabilitated, they, along with their newer counterparts, will reach the end of their useful life soon. This coupled with the growing ridership demands prompted BART to purchase new railcars. Based on customer feedback, the train interior layout is designed to maximize seating, openness and comfort within the available space. 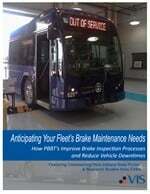 In 2012, BART chose Bombardier Transportation to build its “Fleet of the Future,” as it is dubbed. The project is currently in the design and engineering phase. The agency has 775 railcars on order for a total value of approximately $1.5 billion. BART will eventually order a total of 1,000 railcars to increase the number of cars in the fleet by 50%, says Weinstein. “We need that to meet the demand of today and the future,” he explains. The first 10 train cars will arrive in 2015 for testing. In 2017, BART will receive the first train cars for passenger service, with the last cars arriving in 2023. “When these cars start rolling in 2017, we’re expecting to have over 100 new cars in the first year, and that’s going to be a significant increase in the size of our fleet,” Weinstein says. BART will keep most of the old cars running until the fleet is built up to a larger number, and then, begin to retire the old ones. In that first year, BART customers will begin to get some relief from crowded conditions in the peak periods, he says. “We’ll be able to take six-, seven- and eight-car trains and make them longer and a companion project to upgrade our control systems will allow us to run trains closer together as well,” Weinstein says. With the ultimate goal to order 1,000 cars, BART will increase the number of seats in the system and the fleet by 38%. Customers were able to test out design mockups of the new railcar. Prior to the contract with Bombardier, BART started a public outreach and design process to elicit feedback from its customers. “It’s important to get it right, because it’s something you’ll live with for a long, long time,” Weinstein says of the decision to get customer input. Conditions have changed since the original BART cars were designed, while ridership on the system, as well as current technologies, have also changed dramatically. “We wanted to take advantage of all the technological options that are available today, such as modern materials, passenger information systems and energy efficiencies, like LED lighting,” Weinstein says. After going through a conceptual design phase, BART invited the public to give feedback on what they like and don’t like about the old cars (see sidebar) and also provide information about other systems they’ve traveled on, Weinstein says. Upon doing so, the agency had better clarity about what it wanted when it began the formal design and engineering process with Bombardier. 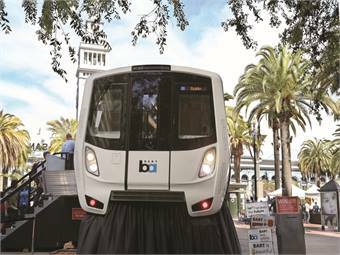 Since the project began in 2009, BART has collected feedback on current and proposed designs via email, online surveys and public events, where customers were able to test out design mockups. One such event included a seat lab conducted last fall, where customers were able to test seats from different transit systems as a way to get early input on seat design. In July 2013, 5,000 people toured a full-scale model of the train interior at MacArthur station to provide feedback. Based on the input from that event, Bombardier implemented vehicle improvements for a current mockup that was unveiled for a series of events in May 2014. Vehicle improvements for the current mockup include a reconfigured layout designed to maximize seating and comfort; more priority seating for seniors and people with disabilities; wheelchair areas at the end of each car and bicycle racks in every car. Other new features include more comfortable seats; interior and exterior digital displays showing passenger information; a better quality PA system, including automated announcements; more doors to make boarding faster and easier; energy-saving lighting; and energy efficient propulsion and regenerative braking. The new cars will also have compressible buffer zones at the end of each car for crash safety. Other key railcar features of the new train design include more handholds for shorter and mobility-impaired individuals. For taller customers, the design features a higher ceiling over the middle aisles. Bombardier also incorporated a multi-branch floor-to-ceiling pole near each doorway. In addition, the new seats, which are almost 50% lighter than the current seats, are fully modular, allowing for seat reconfiguration, which will enable the vehicle to evolve with future rider needs. The seats use longer lasting silicone cushions that will improve lifecycle sustainability. Also, the seats provide more legroom than those on the old trains and are mounted higher off the floor, making it easier for customers to stand up from a seated position as well as providing room underneath to fit carry-on sized luggage. The new cars will also include six interior digital LCD screens, one next to each door that will display the system map, and next-stop and transfer information, as well as travel advisories and other announcements. The new train cars will also have LED screens on the ends of the cars that will display next-stop information. Additional digital screens on the exterior of the cars will display route color and the train’s destination. The new BART train cars will include a variety of features and improvements for people with disabilities, as well as for people who speak languages other than English, Weinstein explains. Since the Fleet of the Future project began, BART has consulted with the accessibility and limited-English-proficient communities via a series of community meetings and prototype evaluations. Through these events BART identified many ways to improve accessibility on the new trains. 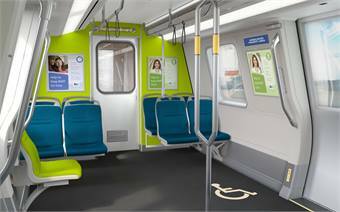 The new train cars will have a wheelchair area at the end of each car, which will accommodate 20 wheelchair users in total on a 10-car train. BART staff is currently working with Bombardier to incorporate a wheelchair graphic in the floor to help remind riders to yield the wheelchair area to wheelchair users when they board the train. In addition to the digital screens, many hearing-impaired riders may benefit from an induction loop system that transmits information directly to receptive hearing aids and cochlear implants. This is a feature Bombardier engineers are planning to develop and test, explains Weinstein. Passengers with sight impairments will benefit from automated audio announcements and a better quality PA system with interior and exterior speakers. In addition to people with disabilities, there’s accessibility for non-English speaking customers as well, explains Weinstein. The digital information screens will rotate certain keywords in different languages. BART’s standard languages besides English are Spanish, Chinese, Vietnamese and Korean. “The digital screens gave us a way to have key information in those languages,” he says. He adds that the best part of the design feedback process has been the one-on-one conversations with customers at various outreach events. “We have people that can bring all kinds of experience to those events,” Weinstein says. “Whether they are Average Joe riders that are just very observant about their daily commute who can bring those kinds of insights, to people who are professional engineers who can see things that maybe we’ve missed,” he says.